CAIRO (AP) — A senior Italian official meeting with Egypt’s president on Monday raised the issue of an Italian student gruesomely killed in Cairo in 2016, objecting to what he said was a lack of progress in resolving the case. Speaking to Italy’s state television in Cairo after meeting President Abdel-Fattah el-Sissi, Roberto Fico, president of Italy’s Chamber of Deputies, said the Egyptian leader assured him that Giulio Regeni’s case was a “priority” for Egypt. In response, Fico said facts, not words, is what counted and demanded that the case be more rigorously investigated and the culprits soon put on trial, according to the channel’s report. His comments contrasted with the relatively upbeat statement put out by el-Sissi’s office after Monday’s talks. According to that statement, Fico told el-Sissi that a “swift and final” resolution of the Regeni case would help boost relations between Cairo and Rome and that he expressed his appreciation for Egypt’s “strong will” to find the killers through cooperation with Italy. El-Sissi assured Fico of his nation’s commitment to “full transparency” in the joint pursuit of the culprits, the statement added. Regeni, a graduate Cambridge University student who researched trade unions in Egypt, was 28 when he disappeared in Cairo on January 25, 2016 — the fifth anniversary of Egypt’s popular uprising when thousands of police deployed across Cairo to pre-empt any attempt to mark the occasion. His body was found several days later by the side of a highway near Cairo with torture marks that activists and rights groups say resembled the results of widespread torture practices in Egyptian detention facilities. Egypt has recently acknowledged that Regeni was being watched by police while in Cairo because of the nature of his research. Fico on Monday said nine people “had moved around Giulio Regeni, a network that tailed him, followed him” and then “abducted him, tortured him and killed him,” according to the Italian state TV report. The case roiled Cairo’s relations with Rome, with Regeni’s family and Italian media accusing Egyptian security forces of torturing and killing him. They have denied any involvement and since 2016 have suggested several alternative scenarios for his death, including being hit by a car or victimized by a criminal gang that specializes in robbing foreigners. Egypt has throughout the Regeni affair hinted that an outlawed Islamist group — the Muslim Brotherhood — was behind the killing to poison relations with Italy and smear Egypt’s international image. As defense minister, el-Sissi led the military’s 2013 ouster of President Mohammed Morsi, a Brotherhood stalwart whose one year in office proved divisive. El-Sissi was elected president a year later and re-elected earlier this year for a second, four-year term. In the comments carried by the Italian state TV, Fico said Regeni was tortured for seven days, and that the torture was not the work of ordinary citizens. Evidence, he explained, indicated that “sophisticated” torture methods were used. Fico’s visit to Egypt is the latest by a top-level Italian official since a right-wing government took office in Italy following elections in March. Fico is a member of the populist 5-Star Movement, the main coalition partner of the anti-migrant League party. 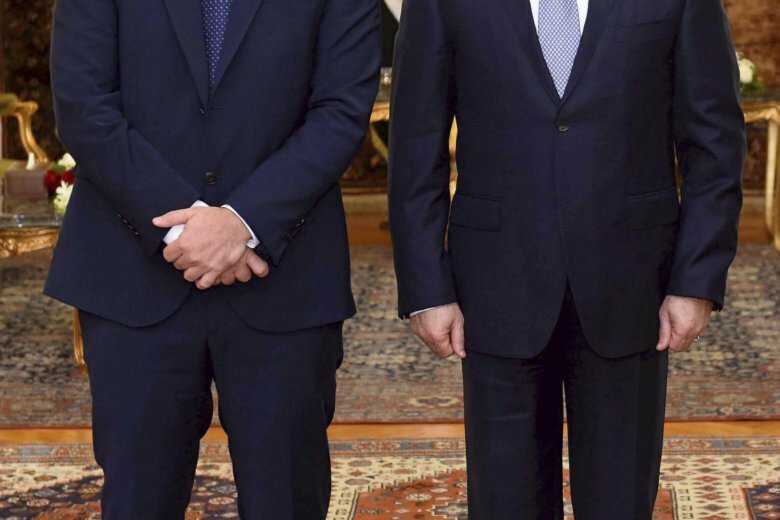 Before Fico, Interior Minister Matteo Salvini and Foreign Minister Enzo Moavero Milanesi came to Egypt and met with el-Sissi. As was the case on Monday, the Egyptian government has in the past consistently released statements after talks between el-Sissi and visiting Italian officials saying they were given assurances of Cairo’s commitment to track down and put on trial Regeni’s killers. But, while Regeni’s case remains a thorn in the side of relations between the two countries, Egypt’s successful efforts to stop illegal migration to Europe, and Italy in particular, has resuscitated a measure of warmth in relations. El-Sissi, according to Monday’s statement, told Fico that Cairo has shown itself to be a “leading and credible” partner with Italy in combating illegal migration, a top priority for the current Italian government. Egypt’s security measures and close monitoring of its Mediterranean coastline have prevented migrants from crossing the sea into Europe since 2016, the country’s leader was quoted as saying. Egypt and Italy are bound by close and mutually beneficial economic and commercial links, including the development of a vast natural gas field off Egypt’s Mediterranean shores that Cairo is hoping will fulfill its ambition to become a regional energy hub.